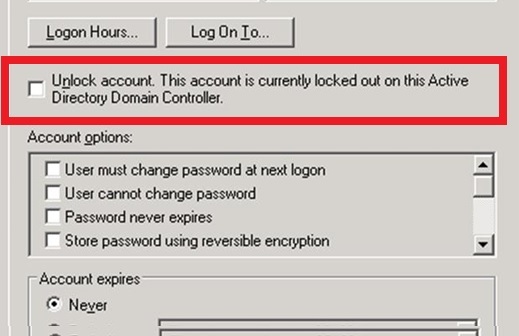 In this article, we’ll describe how to monitor the events of repeated locks of user accounts on Active Directory domain controllers and determine from which computer and program a lock is being performed. We’ll show some examples of using PowerShell scripts and Windows security events to identify the source of account lockouts. An account security policy in most organizations requires mandatory Active Directory user account lockout if the bad password has been entered n times. Usually, the account is locks by the domain controller after several attempts to enter the wrong password for a several minutes (5-30), during which the user can’t log in. After some time (set by security policies), the user account is automatically unlocked. Temporary AD account lockout reduces the risk of brute force attacks. The referenced account is currently locked out and may not be logged on to …. Tip. You can unlock the account manually by using the ADUC console and without waiting till it is unlocked automatically. Find user account, right click and select Properties. Go to the Account tab and check the box Unlock account. This account is currently locked out on this Active Directory Domain Controller. Click OK. The situations when the user forgets the password and causes the account lockout themselves occur quite often. But in some cases, the account lockout happens without any obvious reason. I.e. user declares that he never made a mistake when entering a password, but his account for some reason was blocked. The administrator can unlock the account manually by the user request, but after a while the situation may repeat. In order to solve the user’s problem, the administrator needs to find from which computer and which program the user account in Active Directory was locked. First of all, an administrator has to find out from which computer or server occur bad password attempts and goes further account lockout. If the domain controller closest to the user determines that the user is trying to log in with invalid credentials, it redirects the authentication request to the DC with the PDC emulator role (this DC is responsible for processing account locks). If authentication was not performed on the PDC too, it also responds to the first DC that the user can not be authenticated. 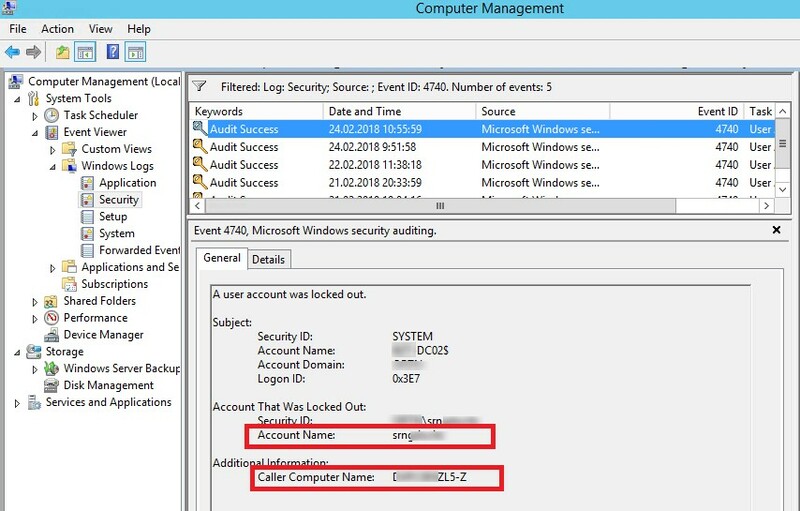 The event of locking a domain account can be found in the Security log of the DC. Filter the security log by event with Event ID 4740. You should see a list of the latest account lockout events. From the topmost, scroll through all the events and find an event that indicates that the account of the user you are looking for (the username is listed in the Account Name value) is locked (A user account was locked out). Note. In a productive environment a large number of events are recorded to the security log on the DC, which can be permanently overwritten. Therefore, it is desirable to increase the maximum log size on DCs and to start the search of lock source as soon as possible. Open this event. Name of the computer from which a lockout has been carried out is shown in the field Caller Computer Name. In this case the computer name is TS01. ‘FilterXPath’ = "*[System[EventID=4740] and EventData[Data[@Name='TargetUserName']='$Usr']]"
Note. If there are several domain controllers, the lockout event has to be searched in the logs for each of them. You can subscribe to the events on other DCs. This task becomes easier with Microsoft Account Lockout and Management Tools (you can download it here). With this tool, you can specify several domain controllers at once to monitor the event logs, look for the bad password count for a certain user (badPwdCount and LastBadPasswordAttempt attributes are not replicated between domain controllers). So, we have found from which computer or server the account was locked out. Now it would be great to know what program or process are the source of the lockout. Tip. There are a number of third-party tools (mostly commercial) that allow an administrator to scan a remote machine and detect the source of the account lockout. As a fairly popular solution, note the Lockout Examiner from Netwrix. 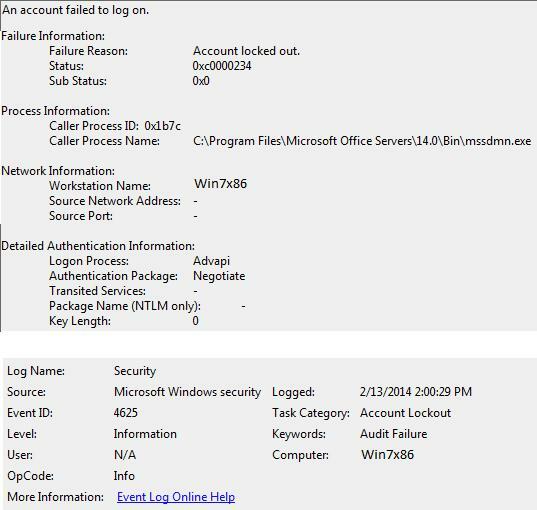 As you can see from the description, the source of the account lockout is a process mssdmn.exe (Sharepoint component). In this case, the user needs to update password on the Sharepoint web portal. After the analysis is over and the reason is detected and eliminated, don’t forget to disable the audit policies. 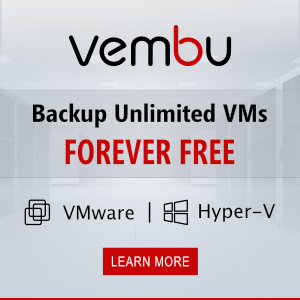 In the event that you could not find out the reason for blocking an account on a specific computer, in order to avoid permanent locking of accounts, it is worth trying to rename the user account name in AD. This is usually the most effective method of protecting against sudden locks of a particular user. I followed the event id 4625 but it doesn’t tell me what app is causing the login attempts. also, no cellphone email, any idea? After filtering for EventID 4740>General [TAB]> “Additional Information: Caller Computer Name: __________” . Log onto “fill in the blank” servername> open <Task Mgr>Users> Log-off all instances of affected userID. I can confirm that not only eventid 4625 can indicate a failed login but 4673 for example. I searched for the locked-out loginname instead in event viewer, this is how I found the app to blame (it was Fiddler). Anyway, the article set me to the right direction, so thanks! In my case the culprit was: Print Spooler service on the computer the lockout originates. After restarting it (Print Spooler), the problem dissapeared. I am facing one of the issue. We are installing Window server 2016 with MDT and once any user logged in, it gets locked out. Do you have any comments, how to resolve this issue? Yes, Domain account is getting locked. Try to enable local audit policies as described above and than check for EventID 4625 description. This way you can determine the process that caused the account lockout. I had the same requirement in my company where helpdesk was looking for a tool that can show them where the account was getting locked out so I have created a small tool that presents these DC lockout events in a nice GUI.